18 mins to recharge a 5k powerbank? Holy Cruppp! That is extremely quick! Based on the website 18 minutes for a full recharge is very, berry, barry impressive! Graphene technology. If it is true, then that is amazing. Of course to have that inside our devices would be even better. Tell you what a Fusion 5000 which recharges your phone in 18 minutes, then recharges itself in 18 minutes, then that would make me impressed. Assuming (as they do not state) 3.7V so is a 18.5Wh capacity, at 45W which is the maximum stated ingest power, you get 24 minutes, not 18 minutes. So that "as little as" 18 minutes, I think it lacks some clarity of what % empty to % full. Currently a lot of fast charging technology is claiming to a less than full fast charge as it's easier to charge faster from empty than it is to full. Their claim: Thanks to Power Delivery Input (60W) and Super Low internal Resistance Graphene Composite Battery, the time for a full recharge takes as little as 18 mins, which is 13x faster than others!. So the input rating is 20V/3a whuch is 60w input not 45. And thus is what I was talking about in the Tesla made a new battery breakthrough. The use if Graphene can be used as a super capacitor and can be rightly charged just as fast. You are correct, my error, I was looking at output not input. I think they are using supercapacitors inside that battery in addition to regular li-ion thus calling it composite battery. Assuming 5000 mAh capacity (@ 3.7V nominal voltage) it has a 5Ah x 3.7V = 18.5 Wh capacity. To fill all this capacity in 18 min (0.30 hr) this battery has to recharge at 61.67 Watts (approx. 60 W). I guess they are claiming that this battery is taking in 60 Watt (20 V x 3 A) charge. 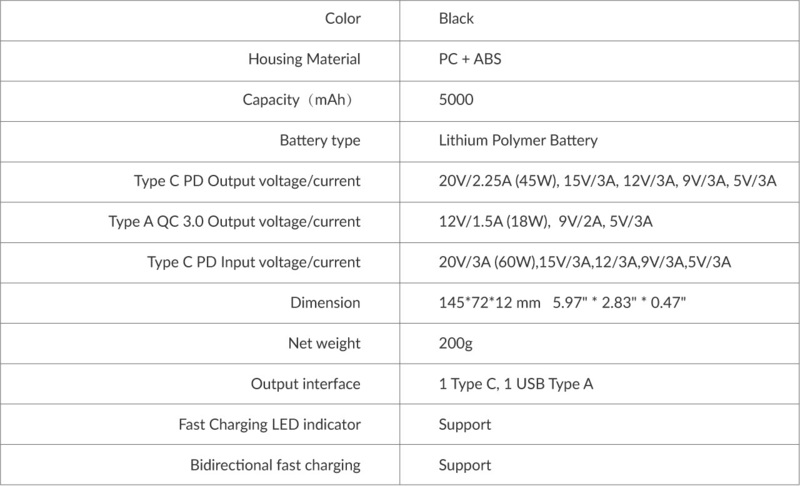 Bottom line is that you cannot charge a 3.7 V li-ion battery with 20 V charging voltage. For a 5000 mAh capacity this thing is huge. I'm very sure that there are a bunch of supercapacitors inside that are connected in series to balance out the 20 V input (leaving about 4.2V for li-ion) and these supercapacitors are then charging the li-ion battery indirectly. Alternatively, they can put 4 or 5 li-ions in series (with balancing circuit) to take in 20 V at 3 A so each cell will see about 4.2V input at 1-1.5A. Incorporation of graphene on li-ion anode will help with high charge/discharge of li-ion thus increased charging rate. 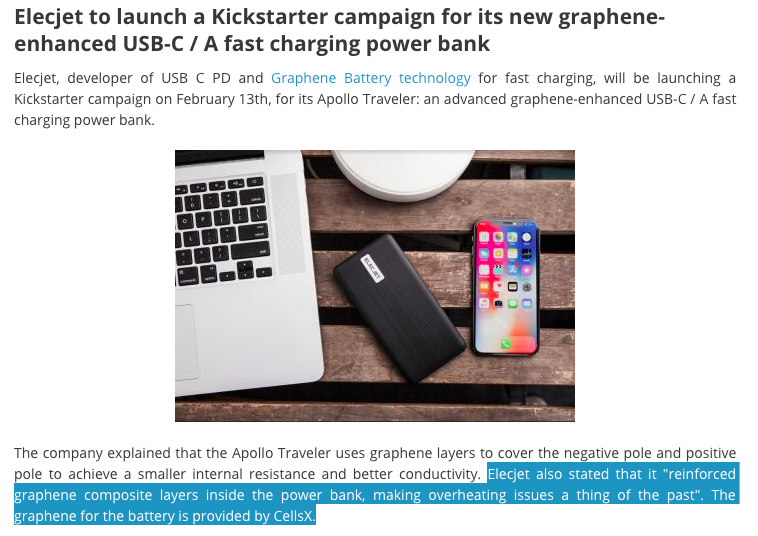 Either way, they are definitely using supercapacitors in addition to li-ions in this powerbank. 8000 cycle life with li-ion is not possible unless paired with supercapacitors. Very sure they are using this CellsX battery (5 in series with balancing circuit). You can see that even at 5A charging current this 1 cell with take an hour to fully charge.